Software Executive Official – This is the kind of title they make up and give you in lieu of an actual pay raise. Synthetic Engine Oil – From what I hear, this is actually a good thing, especially when Wired just predicted $7 per gallon gas coming up. Symbol-Error Outage – Is this when a power plant operator confuses “O” and “I”? Site Enhancing Oils – Why bother with a web designer or SEO when you can just pick up a bottle of Formby’s Site Enhancing Oil (with bonus foam applicator) at Home Depot? Nice list Emory, should add to the confusion. Here’s one you left off the list, Sewage Enforcement Officer. And by the way, you can become SEO certified in that field. That’s a real pearl, David. Sewage Enforcement Officer sounds kind of like SPAM reporting. I guess I should stop this? Do you think this could lead to displaying non-relevant ads? I mean, I do include the written out version just in case. The reason I use the acronym is to catch the traffic from people who don’t bother to spell the entire word out. Ah music to my ears! Got a little concerned there for a second, thanks Emory great post! great list. I think my resume just expanded. Instead of spelling out Search Engine Optimization I think I’ll just list SEO and watch my job prospects go wild. Till date i have told to many co-workers about my job which is of seo, so now i think in which category they must have assumed. LOL!! Great effort. Keep doing on Emory. Great post. As a SEO people, i just know SEO means Search Engine Optimization. 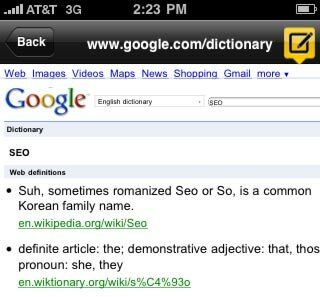 After seeing the list i just wondered they are so many abbreviation for SEO. Even more SEO meanings, wow. Nice finds Ashley! can any one help pls ? Yes Ravi, that shouldn’t be a problem. However, you’ll want to be as descriptive as you can with the alt attribute. If your image is of a web template then you should describe that image as such. Make sure that your alt attribute accurately describes the what the users see. Thank you Mr. Emory Rowland for your great information.